Using "old-fashioned" MLC, this solid state drive is a consistent, if unspectacular, performer and a great deal. Oftentimes, “solid” is perceived a boring adjective. (Unless of course, you’re talking about the ground you’re standing on in a liquefaction zone. During an earthquake.) 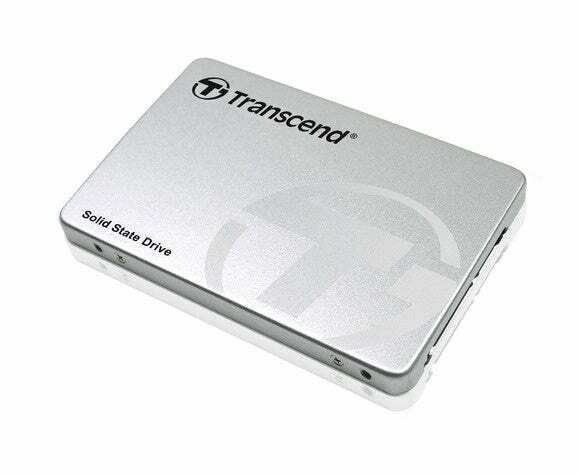 But boring or not, “solid” as it pertains to the overall performance of Transcend’s Solid State Drive 370 has me doing a happy dance. Why would a midrange drive and mundane modifier invoke such delight? Too much time spent testing TLC SSDs that slow to hard drives speeds when writing large amounts of data, that’s why. When I found out that the SSD370 is available at the the same price or less than those standing-on-shaky-ground TLC newbies, my dance went up-tempo into a very energetic jig. The SSD370 is a 2.5-inch, 7mm SATA 6Gbps drive available in 128GB to 1TB capacities and uses 16nm Micron MLC (Multi-Level Cell/2-bit) NAND, not slow TLC. As to those delightful prices, while the 512GB version I tested retails for $270, it’s available on Amazon for a mere $151, or 30 cents a megabyte. The other capacities also sell at 30 cents per. 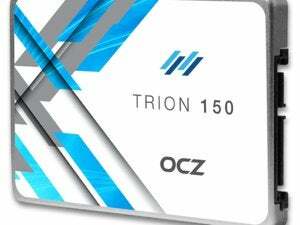 When I checked online, that was right around the price of the cheapest TLC SSDs (OCZ Trion, Toshiba Q300, etc.). While not the fastest SATA SSD we’ve tested, the SSD370 still performed, yes, that word again—solidly—in all our tests. According to AS SSD, sustained sequential throughput was 492MBps while reading and 430MBps when writing. 4KB file writes proceeded at 94MBps and 4KB reads at 25MBps. The latter ramped up nicely when using 64 threads, to 251MBps and 270MBps. 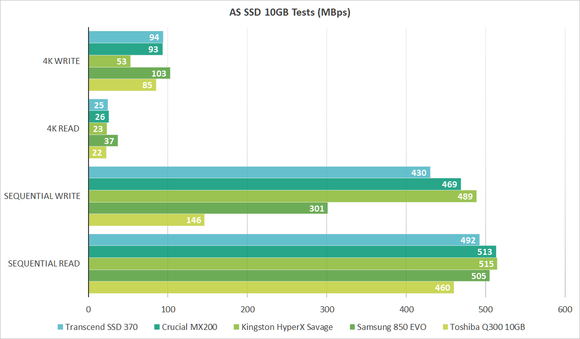 Not all SSDs improve when threaded. 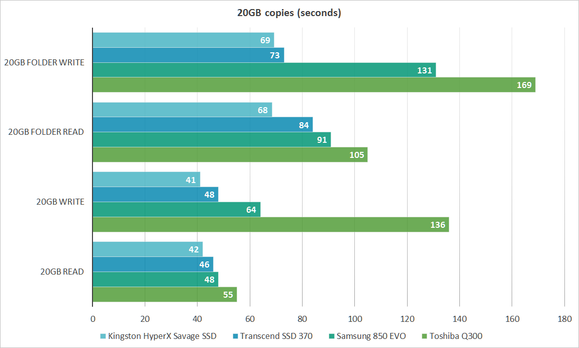 AS SSD’s conclusions were borne out in our real-world copy tests. Reading a 20GB file took 46 seconds (434MBps) and writing it took 48 seconds (416MBps). With a 20GB group of files and folders, reading was finished in 84 seconds (238MBps) and writing in 73 seconds. If I have any qualms at all about the Transcend SSD370, it’s that the warranty is for only three years. That does, however, come with a considerably higher TBW (Terabytes Written) rating than that offered by much of the competition (550 for the 512GB version). And considering the price, the warranty is hardly worthy of concern. Most SSDs should last far longer than their warranties, now that controllers (the big problem in the bad old days) have matured. I haven’t seen a data error, let alone an out-and-out SSD failure in about three years. Speaking of controllers, the SSD370 uses its own custom version of the SM2246EN (Silicon Motion) which it labels the TS6500. What they’ve changed beyond the label, I couldn’t tell you, but it performs nearly identically. The SSD370 is very capable. It might not be a top-tier performer, but it’s still easily fast enough to give you the real-deal SSD experience. And, as it never drops off when writing large amounts of data, I’d opt for it every time over like-priced TLC competition such as OCZ’s Trion and Toshiba’s Q300, and possibly even Samsung’s EVO series, although the EVO doesn’t drop off nearly as badly as the other two, so it could be a tossup. Note: As to the liquefaction zone comment. What can I say? I live a block and half from one in San Francisco, and yes, I was here in ‘89. There are no TLC-like large-file performance drop-offs with this MLC NAND drive. Outside of the somewhat short 3-year warranty, we have zero complaints about the SSD370, and it's just as cheap as the slower TLC competition.